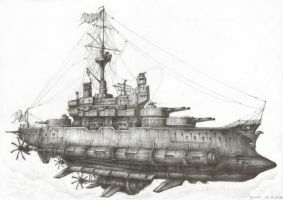 "The surviving ships of the Gothic Fleet took off for their final battle of the long war"
Just some rather random idea that popped up while watching some vids on World War II. Pretty sure this design have fatal flaws if you can show me the whole ship. The concept of the painting is certainly intriguing, the composition of the work enhances the already strong impression of the scene. A girl waving goodbye to the fleet, standing on top of a pile of rubble, acts as a significant symbol, encompassing both hope and despair. In general, the painting is implemented in an excellent manner, some elements are particularly worthy of praise (that red balloon, for an example). Beautiful - found this via Secrets of The Third Planet on YouTube. Can I buy a poster? Sure you can either get it via the dA art store, or direct from me. This is sublime. It speaks to my soul. What this reminded me of. This is a news photo from years ago, the site is the naval yard at Yokosuka, at a time when the US Fleet was on stand down. wow sweet idea. If the Goths had survived the old era and formed an empire, then built a skyfleet? Toasty. I absolutly love this picture. i once did a novel about a lost fleet sailing from a large industrial island. it was a mix of american, and german WW2 ships. with 80-90's era subs. and a irl did see them off seing this kinda reminded of it..the fleet was all black. Absolutely amazingl ship, i mean... wow... Beautifully done!!!! really like ^.^ may i pleeaassee use it as a picture for my story that i'm doing, and yes i will say its by you and have the link please? An awesome idea it was. Thank you for persuing it. Uh, I like that ballooon! This image is awesome really it actually inspires me to write a fiction poem about the girl! It holds such a great story. Wonderful art, do you mind if I write a poem about your picture? my respects, you draw well!!. really your work impressed me, keep going!. I thing you will be a great artist. I always get weird idea while watching WWII stuff, so I know how you feel. By the way, good job on this.